Asus ROG Strix Scar II has a distinct and stylish design, good performance and an excellent display. 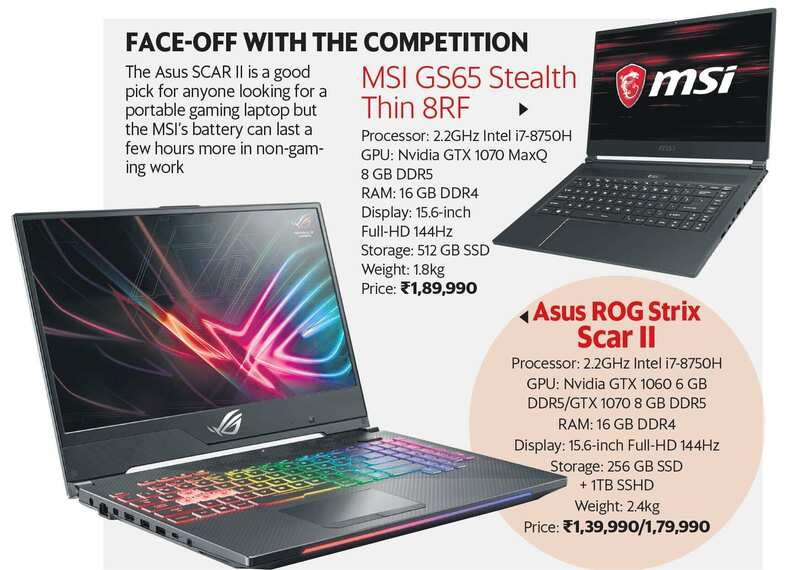 New Delhi: The recently launched Asus ROG Strix SCAR II is a laptop designed for gamers who are on the move. It packs Nvidia’s GTX 1060 GPU (graphics processing unit), with an option for the GTX 1070 as well. Looks: For a gaming device, it has a thin and light build, but a tank-like body. You get a carbon fibre finish on the keyboard deck, half of which has a camouflage pattern. The lid has a brushed metallic design, split into two halves, each of which has been brushed in a different direction. The Asus logo also glows in full RGB colour on the lid. This is common for gaming laptops today but something that gamers like nevertheless. Display: One of the primary updates this year is the laptop’s 144Hz Full-HD display. That means higher frame rates while gaming. And, thankfully, the internals support that. Power: Games like BioShock Infinite clock above 100 frames per second (FPS) at the highest settings. You can also get some games to use the full power of this display at ultra settings. Keyboard: Complementing the performance is a very well-designed keyboard, with a full numpad on one side, well-spaced arrow keys, and full RGB backlights. Key travel is perfect for typing. It’s also not noisy. Heating: Besides, Asus’ HyperCool Pro technology ensures that the keyboard deck never really gets too hot, though you can feel some heat on the underside, which is understandable. Drawbacks: While the keyboard makes the laptop suitable for work, perhaps the only downside here is its battery life. On the one hand, it matches most gaming laptops on the market with about four hours of non-gaming work per charge. However, the Nvidia MaxQ GPU-based MSI GS65 Stealth Thin 8RF can last a few hours more, albeit with measurably lower performance. The other compromise is that the webcam is placed on the bottom right. That’s because the laptop has a nearly bezel-less display. Verdict: Overall, the Asus ROG Strix SCAR II packs a punch and is a good pick for anyone looking for a portable gaming laptop. It has a distinct and stylish design, good performance and an excellent display.